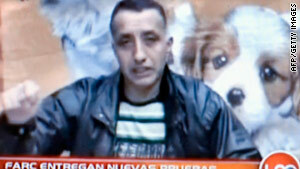 Grab from Colombian television purportedly shows police officer Luis Alberto Erazo speaking. (CNN) -- Colombian TV stations aired proof-of-life videos Monday of five hostages being held by Marxist guerrillas. The Revolutionary Armed Forces of Colombia, known as the FARC, released the videos two weeks before Colombia holds a run-off election for president. In the video, the captives ask Colombians to make a careful choice for president and to pick a candidate who will work toward their freedom. The FARC have been waging war on the government since the 1960s and have routinely taken hostages. Several captives have been released through the years, including two in March. The rebels released six hostages last year. The broadcasts identified the hostages as Captain Edgar Yesid Duarte, Sergeant Jose Libio Martinez Estrada, police Lieutenant Elkin Hernandez Rivas, Sergeant Luis Alberto Erazo and Quatermaster Alvaro Jose Moreno. According to CNN affiliate Caracol TV, which said it received a copy of the videotape from the FARC, Martinez was abducted December 22, 1997, when the rebels overran a military base. Hernandez has been held for 12 years, Caracol said on its Web site. Yesid Duarte was taken captive Oct. 14, 1998, the CNN affiliate said. Luis Alfredo Erazo was captured Aug. 3, 1998, in a FARC attack on a police anti-narcotics base, Caracol said. Nine police died in the attack and 63 were abducted, Caracol said. Nine remain captive. Alvaro Moreno was taken captive on Dec. 9, 1999, in attack on a municipal police station, according to Caracol. Seven officers were abducted and two remain captive, the TV station said. There was no indication from the guerrillas that any of the hostages would be released soon. The FARC said in March that the two captives it released that month were the last ones who would be freed unconditionally. The rebels have sought negotiations with the government of President Alvaro Uribe, but he has refused to talk with the guerrillas.